Myles Hippolyte's extra-time goal gave Livingston victory over Peterhead in the quarter-finals of the Scottish Challenge Cup. Gary Glen twice threatened for Livi in the first half and he and team-mates David Robertson, Michael McKenna squandered chances after the break. 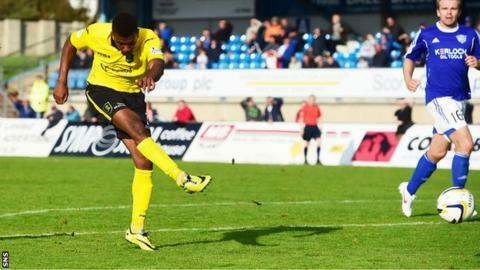 Substitute Hippolyte's strike finally broke down the League One side's resilient defence in the 113th minute. Peterhead had Andrew Rodgers sent off late on for foul and abusive language.